Resurrection-St. Paul School is a Howard County STEM school, as designated by the Archdiocese of Baltimore. Resurrection-St. Paul School, through the teaching of the Catholic Church, is dedicated to the total formation of the child by preparing them for a global society through innovation, problem solving, and cross curricular collaboration. What is a STEM school? Over the past six years, the teachers at Resurrection-St. Paul School have received professional development focusing on a paradigm shift in teaching: moving from a teacher-centered classroom to one that is student-centered. Through professional learning communities and professional staff development, teachers are learning teaching techniques that help students become critical thinkers and innovative problem solvers in preparation for their future careers. In January 2011, the Archdiocese of Baltimore named Resurrection-St. Paul School as one of seven designated STEM Schools beginning with the 2011-2012 school year. The Archdiocese of Baltimore curriculum is used with an intentional focus and cross curricular collaboration on science, technology, engineering, and math. 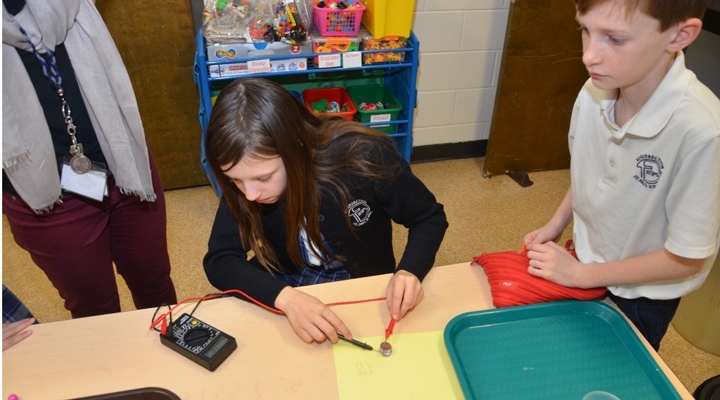 At Resurrection-St. Paul School, teachers have access to a fully equipped STEM lab to create hands-on learning experiences for students at all grade levels. Additionally, a full time designated STEM director works with students and teachers integrating relevant activities into regular curriculum. Resurrection-St. Paul School is proud to lead the way in STEM programs. Additionally, we remain committed to educational excellence in Religion and the Arts making our title more appropriately a STREAM school.